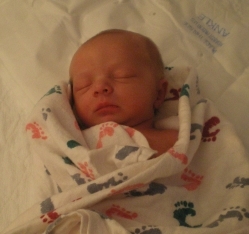 Koleton John Stevenson was born on September 13, 2010 and appeared to be a healthy little guy. On Tuesday the 14th Koleton was airlifted to Rochester St Mary’s Children’s Hospital to undergo a battery of tests. It was found that Koleton had a rare metabolic disorder called Non –ketotic hyperglycinemia or NKH, which is an autosomal recessive metabolic disorder characterized by abnormally high levels of amino acid glycine. NKH is caused by the shortage of an enzyme that normally breaks down glycine in the body. A lack of this enzyme allows excess glycine to build up in tissues and organs, particularly the brain, leading to serious medical problems. Most patients with NKH have the neonatal phenotype, presenting in the first few days of life they are sleepy, and have body jerks and low muscle tone, which progresses into apnea (shallow breathing). And although Koleton’s life was prematurely cut short he was loved from the moment he entered this world, and was able to touch so many people’s hearts in a way that cannot be replaced. Koleton will be remembered forever as our angel.